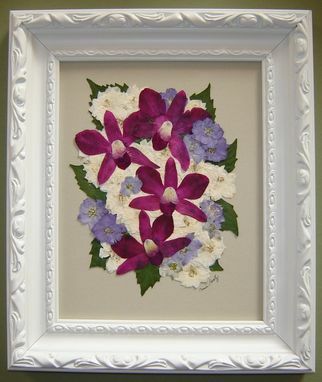 Orchids and Purple/White Larkspur, flowers gathered at a loved one's memorial service are preserved in Pressed Flower Art forever! 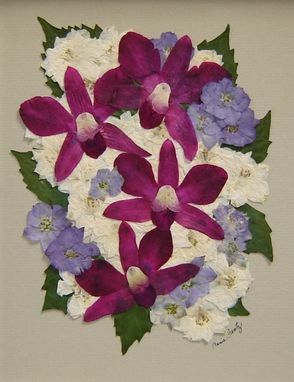 Flowers can be shipped to me from anywhere in the U.S. or brought to my Austin, TX Studio. (Call ahead, please) The flowers are pressed, dried and then creatively arranged according to your wishes. Photo's or other memorabilia can be added for no extra charge. The art, when finished is vacuum sealed and then professionally framed, using museum quality glass. When I am finished, your flowers are now an heirloom.